Point of Attack The Defense Strikes Back by Harry Carson and Jim Smith. The conditions vary, but overall they are in very good condition. I have listed each title below and will note any notable issues affecting condition. Good condition, Autograph is guaranteed to pass authentication!! Light scuffs on upper and lower right corners. P.s. just for your information. there are 20 books in a Org. which actually not bad. great color photo's. (( you will get a NEW UNUSED book never. opened before)). more then one?. Michael Jordan basketball card book. Condition is Brand New. Shipped with USPS First Class Package. For The Love Of The Game: My Story By Michael Jordan. Condition is Good. Shipped with USPS Media Mail. (Item #Z0679415629Z3|0). Notes: Item in good condition. Condition: Good. For The Love Of The Game: My Story By Michael Jordan. Condition is Brand New. Shipped with USPS Media Mail. Michael Jordan NEWSWEEK Special Edition Magazine 35 Years Of Greatness NEW!! Michael Jordan NEWSWEEK Special Edition Magazine 35 Years Of Greatness NEW!!. Condition is Brand New. Shipped with USPS First Class Mail. 3 Chicago Bulls Books Michael Jordan Scottie Pippen. Michael Jordan and the Chicago Bulls 72 Win Season and 1998 NBA Finals Retrospective. 3 softcover books in excellent unread condition. (1998, Paperback). 112 pages, paperback book. Product Info. Condition: New ( see photos for details). 2019 Special Edition. 35 YEARS OF NBA GREATNESS. NEVER READ NEVER OPENED. Author: Matt Christopher; Glenn Stout. Notes: Item in good condition. Condition: Good. 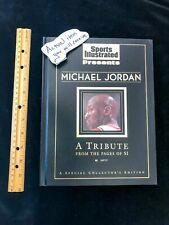 Sports (1992, Hardcover) Neil Leifer Michael Jordan Bulls . Condition is Good. Shipped with USPS Media Mail. Cover has normal wear lines. Please see photos. A GREAT CLASSIC BOOK COLLECTIBLE ! New Michael Jordan NEWSWEEK Special Edition Magazine 35 Years Of Greatness Magazine may have minor wear due to being on public shelve in book stores. Overall a nice magazine but not a magazine to be graded. Thanks for looking and please be sure to check out my other auctions. I recently purchased a large box of game used auto Rookie Patch vintage 1/1 cards. USPS secure shipping! Brand new sealed with slipcover!